Local stamps were produced during 1945 for the Soviet occupation zone town of Plauen in Saxony. Plauen is situated near the borders with Bavaria and the Czech Republic. 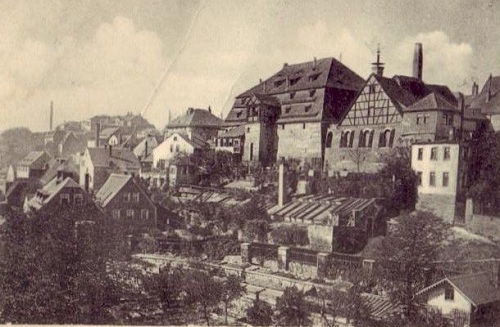 In the late 19th Century, Plauen was a textile manufacturing center, specializing in lace, and in the early 20th Century, it became an industrial boom-town. During the time of the German Democratic Republic, there was a Red Army garrison near Plauen, and later, the town was the site of the training school for DDR border guards. Plauen was the scene of the first mass demonstrations against the DDR in October 1989, which ultimately lead to the downfall of the DDR and the reunification of Germany in 1990. 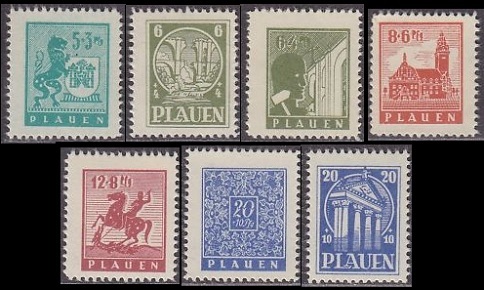 These stamps for Plauen were issued in December 1945, with the surtax going to reconstruction projects and other charities. The stamps were printed on various paper types, and they were perforated 12 1/2. For detailed information on the paper types, gum types, and varieties of this issue, refer to the Michel Deutschland Spezial Katalog volume 2. The designs depict: the city arms, the ruined Elster Viaduct, the rebuilt Elster Viaduct, City Hall, Monument to St. George and the Dragon, Plauen lace, and the entrance to the city theater.